Every day for the past few weeks I’ve been trying to “shop at home” first, creating meals out of things I already have on hand to save on the grocery bill. Since I have two boys who eat a LOT, and we are at home all day, we go through a lot of food. Currently we are between paychecks and our kitchen is INCREDIBLY bare. 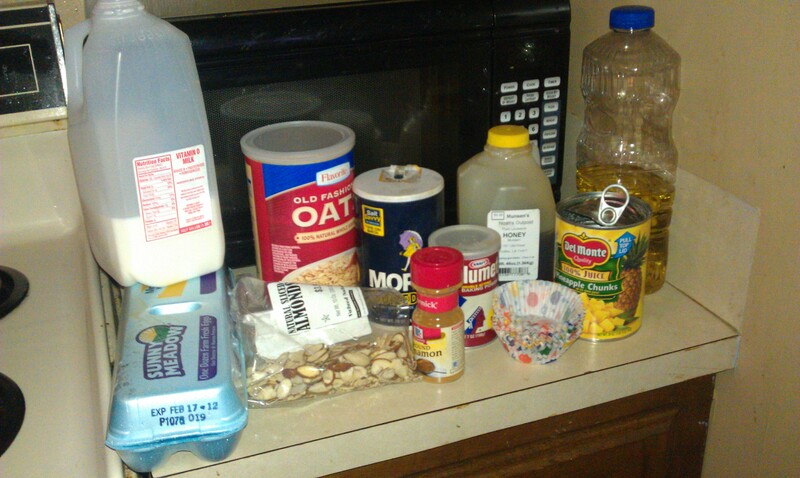 HOWEVER, using my previous dieting experience I found enough things in my cabinet to make some “Oatmeal Cakes”. This is probably the simplest recipe I’ve ever come up with, based on a basic flourless muffin recipe. Combine all ingredients and stir well. Let it soak for about 5 minutes if you’re using old fashioned oats, like I did, because they won’t cook quickly. 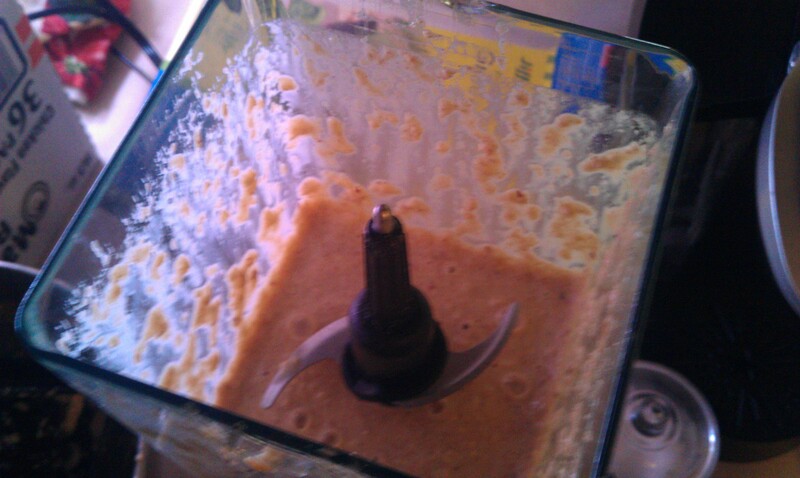 After soaking, transfer all ingredients into a blender and puree all the large chunks out of it. The mixture should look liquid and grainy. It looks pretty gross, actually. But trust me on this. Pour into your muffin liners (fill the cups all the way, they will not rise very much!) and bake for 15 minutes or until the tops are medium to dark brown and the tops of the muffins spring back when touched. This recipe makes 12 cakes. Allow to cool thoroughly before serving. The texture is like a very dense, moist sponge cake. Cook some bacon each morning or a few slices of ham and serve one muffin with some fresh fruit and margarine, you’ve got breakfast for a family of four for three days. 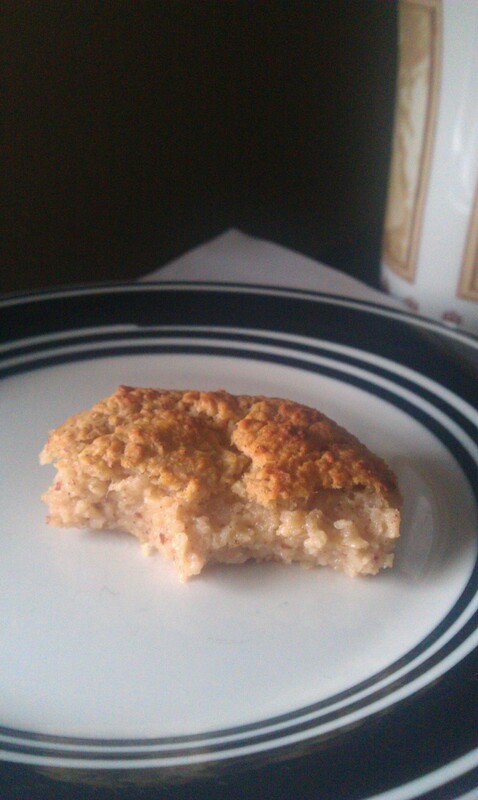 Half-eaten oatmeal cake... these are tangy and delightful and super filling. It’s late at night, I’m hungry, and your flourless outmeal cakes are killing me…. hehe Definitely going to try this recipe, they just sound soooo good! I’ve never had a flourless cake of any kind, so I’m excited!!! They’re pretty good, I don’t like super sweet stuff but I bet they’d be even better with fresh pineapple. Can’t wait for summer time! What is a Panda Mother?